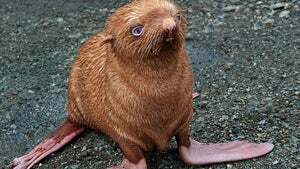 This poor, nearly blind seal pup is an outcast from the rest of his seal colony, because he's red and they're all black. Racists! Be sure and check out the last photo at the link — so very Christina's World. Oh, and of course the little guy (or gal) has a Twitter.